How about a “comic book” form of publication of important suppressed history about the Jesuit/Vatican hand in the creation of Islam and Islam’s founder, the prophet Muhammad? “This information came from Alberto Rivera, former Jesuit priest, after his conversion to Protestant Christianity. It is excerpted from The Prophet, published by Chick Publications, P.O. Box 662, Chino CA 91708. Because of the provocative nature of this material, I (E.Y.) asked Rick Martin to contact SPECTRUM friend Eric Jon Phelps, author of the blockbuster research work VATICAN ASSASSINS, for his opinion. Eric also said, in a later communication, that Dr. Alberto Rivera first publicly released this information back in 1988. Pay attention to the overall picture being painted below; don’t get caught up in arcane theological language and related concepts that obviously derive from Dr. Rivera’s background. The Dark Energies, by any name, reveal themselves through their ACTIONS! Also pay close attention to another thread running through the following narrative – one which provides important background for the long-running Arab-Israeli conflict. In beautiful contrast to what you’re programmed to believe through the media, that Arabs and Israelis can’t get along, elsewhere in this issue of The SPECTRUM is a very warm and personal account of some Jews sharing in the hospitality of some Arabs. The actual (natural) inclination for people of even diverse backgrounds to generally live in peace and get along with each other on common human grounds always reveals when there has been the instigation of conditions (by diabolical ones operating behind the scenes) that are calculated to artificially provoke strife and war. The following is a good example of just such behind-the-scenes shenanigans that are carried out by ones long overshadowed by the Dark Energies. But the Jews rebelled against Rome, and in 70 A.D. Roman armies under General Titus smashed Jerusalem and destroyed the great Jewish temple which was the heart of Jewish worship – in fulfillment of Christ’s prophecy in Matthew 24:2. On this holy place, where the temple once stood, the Dome of the Rock Mosque stands today as Islam’s second most holy place. The only way Satan could stop this thrust was to create a counterfeit “Christian” religion to destroy the work of God. The solution was in Rome. Their religion had come from ancient Babylon, and all it needed was a face-lift. This didn’t happen overnight, but began in the writings of the “early church fathers”. It was through their writings that a new religion would take shape. The statue of Jupiter in Rome was eventually called St. Peter, and the statue of Venus was changed to the Virgin Mary. The site chosen for its headquarters was on one of the seven hills called “Vaticanus” – the place of diving serpent where the satanic Temple of Janus stood. Three major religions have one thing in common – each has a holy place where they look for guidance. Roman Catholicism looks to the Vatican as the Holy City. The Jews look to the wailing wall in Jerusalem, and the Muslims look to Mecca as their Holy City. Each group believes that they receive certain types of blessings for the rest of their lives for visiting their holy place. In the beginning, Arab visitors would bring gifts to the “House of God” and the keepers of the Kaaba were gracious to all who came. Some brought their idols and, not wanting to offend these people, their idols were placed inside the sanctuary. It is said that the Jews looked upon the Kaaba as an outlying tabernacle of the Lord, with veneration until it became polluted with idols. 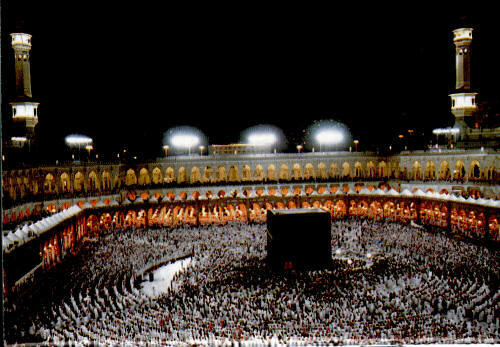 In a tribal contention over a well (Zamzam) the treasure of the Kaaba and the offerings that pilgrims had given were dumped down the well and it was filled with sand; it disappeared. Many years later Adb al-Muttalib was given visions telling him where to find the well and its treasure. He became the hero of Mecca, and he was destined to become the grandfather of Muhammad. Muhammad’s father died from illness, and sons born to great Arab families in places like Mecca were sent into the desert to be suckled and weaned and spend some of their childhood with Bedouin tribes for training and to avoid the plagues in the cities. The Roman Catholic monk had fanned the flames for future Jewish persecutions at the hands of the followers of Muhammad. The Vatican desperately wanted Jerusalem because of its religious significance, but was blocked by the Jews. Some Arabs had become Roman Catholic, and could be used in reporting information to leaders in Rome. 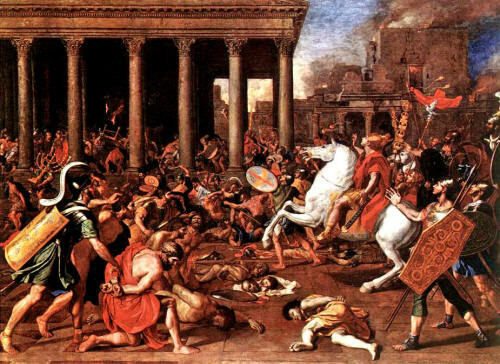 Others were used in an underground spy network to carry out Rome’s master plan to control the great multitudes of Arabs who rejected Catholicism. When “St. Augustine” appeared on the scene, he knew what was going on. His monasteries served as bases to seek out and destroy Bible manuscripts owned by the true Christians. Khadijah had a cousin named Waraquah, who was also a very faithful Roman Catholic, and the Vatican placed him in a critical role as Muhammad’s advisor. He had tremendous influence on Muhammad. Teachers were sent to young Muhammad and he had intensive training. Muhammad studied the works of St. Augustine, which prepared him for his “great calling”. The Vatican had Catholic Arabs across North Africa spread the story of a great one who was about to rise up among the people and be the chosen one of their God. Muhammad instructed some of them to flee to Abysinnia, where Negus, the Roman Catholic king, accepted them because Muhammad’s views on the virgin Mary were so close to Roman Catholic doctrine. These Muslims received protection from Catholic kings because of Muhammad’s revelations. History proves that before Islam came into existence, the Sabeans in Arabia worshiped the moon-god who was married to the sun-god. They gave birth to three goddesses, who were worshipped throughout the Arab world as “Daughters of Allah“. An idol excavated at Hazor in Palestine in the 1950s shows Allah sitting on a throne with the crescent moon on his chest. Some of Muhammad’s writings were placed in the Koran, others were never published. They are now in the hands of high ranking holy men (Ayatollahs) in the Islamic faith. In their “holy” book, the Koran, Christ is regarded as only a prophet. If the pope was his representative on Earth, then he also must be a prophet of God. This caused the followers of Muhammad to fear and respect the pope as another “holy man”. The Arab generals had such military success that they could not be intimidated by the pope – nothing could stand in the way of their own plan. Under Waraquah’s direction, Muhammad wrote that Abraham offered Ishmael as a sacrifice. The Bible says that Isaac was the sacrifice, but Muhammad removed Isaac’s name and inserted Ishmael’s name. 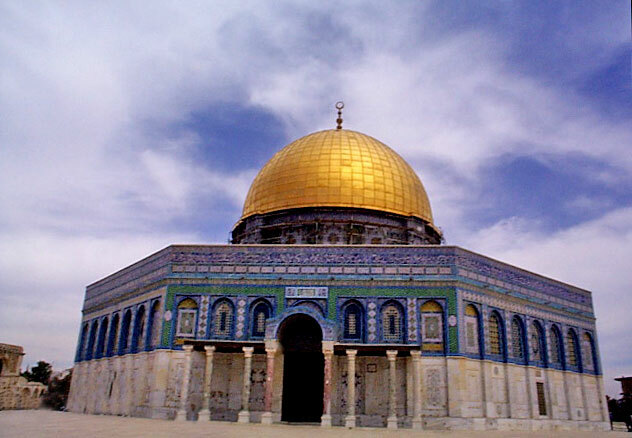 As a result of this and Muhammad’s vision, the faithful Muslims built a mosque, the Dome of the Rock, in Ishmael’s honor, on the site of the Jewish temple that was destroyed in 70 A.D. This made Jerusalem the second most holy place in the Islamic faith. The pope realized what they had created was out of control when he heard they were calling “His Holiness” an infidel. The Muslim generals were determined to conquer the world for Allah, and now they turned toward Europe. He wouldn’t think of sharing it with those whom he considered heathens. The pope raised up his armies and called them “crusades” to hold back the children of Ishmael from grabbing Catholic Europe. The crusades lasted for centuries and Jerusalem slipped out of the pope’s hands. Turkey fell, and Spain and Portugal were invaded by Islamic forces. In Portugal, they called a mountain village “Fatima” in honor of Muhammad’s daughter, never dreaming it would become world famous. As a result, the Muslims were allowed to occupy Turkey in a “Christian” world, and the Catholics were allowed to occupy Lebanon in the Arab world. It was also agreed that the Muslims could build mosques in Catholic countries without interference, as long as Roman Catholicism could flourish in Arab countries. The Vatican also engineers a campaign of hatred between the Muslim Arabs and the Jews. Before this, they had co-existed peacefully. A light control was kept on Muslims – from the Ayatollah, down through the Islamic priests, nuns, and monks. The Jesuits wanted Russia involved, and the location of this vision at Fatima could play a key part in pulling Islam to the Mother Church. In 1917, the Virgin appeared in Fatima. “The Mother of God” was a smashing success, playing to overflow crowds. As a result, the Socialists of Portugal suffered a major defeat. As a result of the vision of Fatima, Pope Pius XII ordered his Nazi army to crush Russia and the Orthodox religion, and make Russia Roman Catholic. 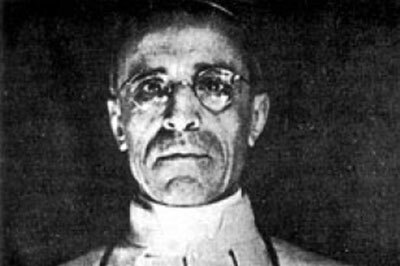 A few years after he lost World War II, Pope Pius XII startled the world with his phony “dancing Sun” vision to keep Fatima in the news. It was great religious show biz and the world swallowed it. As a result, a group of followers has grown into a Blue Army worldwide, totaling millions of faithful Roman Catholics ready to die for the Blessed Virgin. But we haven’t seen anything yet. The Jesuits have their Virgin Mary scheduled to appear four or five times in China, Russia, and major appearance in the U.S.
Bishop Sheen pointed out that the pilgrim virgin statues of Our Lady of Fatima were enthusiastically received by Muslims in Africa, India, and elsewhere, and that many Muslims are now coming into the Roman Catholic Church. Double Cross, Chick Publ, pgs 13,14. The Meaning Of The Glorious Koran, Pickthall, Mentor Books, pgs 220,221. Muhammad, Martin Lings, pgs 81-84.